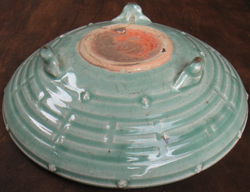 The Celadon incense burner is shaped as flattened bowl. The underside has an interesting geometric design with blossom-shaped studs around the upper section. 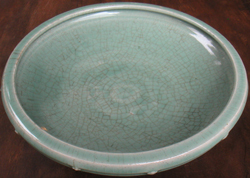 The piece is covered in a translucent green glaze that is crackled in a typical Celadon manner. The artifact was produced in China, probably in the region of Longquan in Zhejiang province. It was brought to Southeast Asia as a valuable trade-good probably by an ancient Chinese trading ship and sold among one of the many thriving Chinese communities living in Southeast Asia. The object probably ended up as a burial object of a prominent individual. Centuries later, it was rediscovered by excavators and subsequently acquired by The Chalre Collection through a registered dealer. Produced in the Ming Dynasty period (1368 - 1644).